The Little Ones One-Piece Urostomy Pouch with Cut-to-Fit Stomahesive Skin Barrier is a 5 inch transparent pouch. 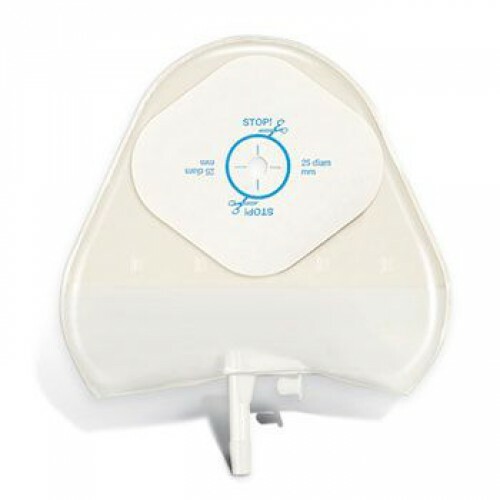 The Little Ones Ostomy System is designed just for kids and, as with the adult systems, a full range of products is offered to meet the child's needs or the parent's preference but have been scaled down in size to comfortably fit a child's body contour. Little Ones products are designed with an active child in mind which means they're flexible, durable, and easy to remove, so there's minimal discomfort and parents love them because they let kids get back to being kids. The Stomahesive skin barrier offers reliable peristomal skin protection, dependable adhesion, and added comfort during wear and removal. For other Little Ones options for children, check out the Little Ones One-Piece Drainable Pouch with Cut-to-Fit Stomahesive Skin Barrier which is more appropriate for a ileostomy or colostomy, or the Little Ones One-Piece Extra Small Drainable Pouch with Stomahesive Skin Barrier and InvisiClose Tail Closure System which is a drainable 2-piece system. Cut-to-Fit Stomahesive Skin Barrier fits stoma sizes 5/16 Inch up to 1 Inch. Each box includes two night drainage adapters.